This has obviously been a difficult year for mechanically harvested forages. Not only has it been nearly impossible to harvest dry forage, but reports are becoming more numerous of damaged forage stands due to the excessive rainfall we’ve experienced. This is especially true of alfalfa. Summer regrowth of alfalfa is poor in many fields and many stands are declining, especially where wheel track damage occurred due to the wet soils during harvest operations. Corn silage yields are expected to be lower in many fields. So overall stored forage supply is tight and forage quality of hay crops has been poor for many due to delayed harvest and rained on hay. The need for additional forage supplies this summer is significant for many. Earlier this summer I wrote an article about options for producing supplemental forage from annual crops planted in June. Here I discuss options for producing supplemental forage from late summer plantings. The most convenient areas for planting annual forages for the remainder of this growing season are in fields coming out of wheat grain harvest and corn silage that will be harvested in late August to early September. Of course, acres where corn or soybean plantings were prevented by wet weather can also be used, provided the corn or soybean herbicides applied are not harmful to forage plantings. Always check herbicide labels for crop rotation restrictions prior to planting forages. Sudangrass, sorghum x sudangrass hybrids, pearl millet, and forage sorghum establish and usually grow rapidly this time of year, but we are right up against the deadline for getting them planted. Wet and cool weather is not favorable for these grasses, but the weather outlook for the remainder of July is for warmer and drier conditions than we’ve had so far, and this would favor these grasses. These grasses should only be considered now in central to southern Ohio and ONLY IF they can be planted yet this week (many areas will be too wet). Planting now in northern Ohio or after this week in the rest of the state is more risky. Two years ago we produced 2 to 4 tons of forage dry matter from sudangrass or sorghum-sudan that was planted on July 19 in west central Ohio. The yield depended on the harvest date and the forage quality changed little once the forage was waist high or above. For dairy, I strongly encourage planting the BMR types for greater digestibility. Refer to the Agronomy Guide (pages 111-114) for how to reduce the risk of prussic acid poisoning in autumn harvests and for more details on establishment and management (http://agcrops.osu.edu/specialists/fertility/fertility-fact-sheets-and-bulletins/agron_guide.pdf/view). 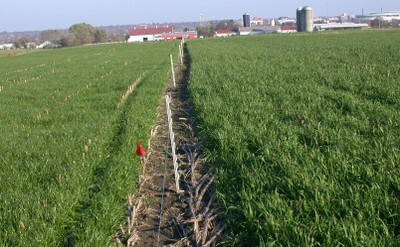 The best options are to plant spring oat, spring triticale, or annual ryegrass (see section below on annual ryegrass). An increasing number of Ohio producers are gaining experience with August plantings of oat. Oat seed usually can be purchased at a more economical price than spring triticale, but either species will produce good dry matter yields within 60 to 80 days after planting. When planted the first two weeks of August and with adequate rainfall, oat and spring triticale can produce from 2500 to 5000 lbs/acre of dry matter by mid-October. The lower yields occur when leaf rust becomes a problem, which is a possibility in a damp year like we’ve had so far. They will reach the boot stage of growth in October, which provides the best compromise of yield and forage quality. If harvest is delayed until November, the early August planted oat and spring triticale will be in heading stage and will yield 6000 lbs of dry matter/acre or more. Early August planted oats or spring triticale forage will have crude protein (CP) content of 12 to 15% and neutral detergent fiber (NDF) of 38 to 50% depending on planting date and stage at harvest. These small grains will have to be put up as silage or balage if being mechanically harvested. Spring oat, spring triticale, and annual ryegrass can also be planted from late August to mid-September, immediately after an early corn silage harvest. These later planting dates will produce lower yields (1500 to 3000 lbs dry matter/acre) than August plantings and harvest will be delayed into months with poor drying conditions (November to early December). Plantings in early September would be an excellent option for grazing or green chopping. Forage quality will be very high with these later plantings – CP will range from 20 to 32%, NDF will be 30 to 38%, and NDF digestibility will be 75 to 85%. If an early spring forage harvest is desirable next year, winter triticale and winter rye should be included in mixture with the spring oat and spring triticale planted in late August and early September. Wheat, winter triticale, and winter rye can be planted to produce good yields of high quality forage early next spring. Rye grows and matures rapidly in the spring and has the deserved reputation of becoming “like straw” in a short period of time once it turns reproductive. Wheat and winter triticale will be easier to manage next spring because they mature more slowly than rye. Wheat planting should be delayed until after the Hessian fly-safe date, which is 22 September in northern Ohio and 5 October in southern Ohio (Hessian fly feeding can reduce forage yield). Forage quality can be excellent for these species if harvested in boot stage of growth in the spring, producing from 2 to 4 tons/acre of dry matter depending on stage of harvest. Annual/Italian ryegrass is another good option for producing high quality forage, especially for grazing in late autumn and early winter followed by forage harvests or grazing next year. Some varieties are more likely to survive the winter than others. The varieties Marshall, Winterhawk, and Fria all survived the very cold winter of 2013-2014 much better than many other varieties we tested. Additional data from our September plantings in 2014 will be made available soon. 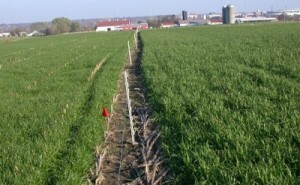 Refer to the Ohio Forage Performance Trials for selecting varieties, check the Forage Archive for past years of performance (http://hostedweb.cfaes.ohio-state.edu/perf/). The forage quality of annual/Italian ryegrass will be at least equal to or higher than that of the small grain forages discussed above. We have planted annual ryegrass in early September for several years, obtaining 800 to 2000 lbs of dry matter/acre of forage by late November and early December, with yields of 3 to 5 tons of dry matter/acre the following year from improved varieties with good winter survival and with adequate nitrogen fertilization. Annual ryegrass can be planted earlier in August, especially if soil moisture is present (definitely true this year), which should provide higher yields in late autumn (up to 3000 lbs/acre dry matter). Plant high quality seed of a named variety to ensure high germination rate and avoid unpleasant surprises regarding varietal identity and crop characteristics. Oat should be planted at 75 to 100 lbs per acre and spring triticale at 90 to 110 lbs/acre when seeded alone. Winter rye should be seeded at 110 lbs/acre while wheat and winter triticale should be seeded at 110 to 120 lbs/acre. For mixtures of these small grains, the seeding rate of each component can be reduced to 70% of the full rate. Plant 20 to 25 lbs/acre of annual ryegrass seed and apply 30 to 50 lbs N/acre either at planting or at early tillering stage. Additional nitrogen will be required next spring for good production. When planting in early August, field peas or soybeans could be added to the mixture to boost the CP content of the forage, an important consideration for dairy producers this year. While we have no data on planting such mixtures in August, we would expect the CP content to be increased by 3 to 4 percentage units when including field peas or soybeans with oats or spring triticale planted by August 10 to15. This should provide an extra value of $40 to $50/acre from the increased protein content of the forage. This needs to be compared to the extra cost of the legume seed included in the mixture. Field peas should be inoculated with N-fixing bacteria and sown in the mixture at 70 to 90 lb/acre. Soybean seeding rates for this application are not well-defined, but perhaps should be included in the mixture at 60 to 70% of normal soybean seeding rates. If the legume seed cost is no more than $50/acre, then including the legume in the mixture should be cost effective for lactating dairy cows, because the legume-small grain mixture should have lower NDF content leading to higher forage intake and greater milk production. Several brassica species can be planted in early August for autumn and early winter grazing. For more information on this option, refer to The Ohio Agronomy Guide, pages 114-118. Posted by Smith at 12:23pm August 6, 2015 Posted in Forages, Pasture. Bookmark the permalink.